Flip up the Mustek DVT407s front and a 7-inch 16:9 aspect ratio LCD and a DVD player are revealed, complete with speakers and basic controls: entertainment on the go. Setup is straightforward. Thanks to an easily negotiated instruction manual and user-friendly onscreen menus, you can be watching a DVD within minutes of plugging in the provided adapter. Connectivity includes two headphones sockets, aerial input and a S-video/progressive scan output for routing sound and images to another display. Features include an electronic programme guide (EPG), favourite programmes list, games and Picture CD playback. 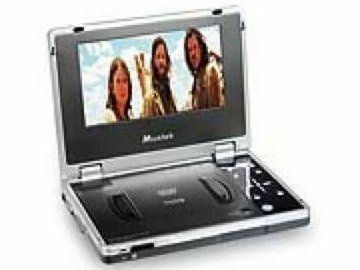 What's enticing about this portable DVD player is its digital TV tuner, which means it gives Freeview pictures on-the-go. Portable TVs are often at the mercy of their reception area, and the Mustek is no exception. We were only able to tune into a handful of channels, but the Mustek kept losing their signals. Pictures were good, during the brief period we were able to see them. The aerial connection seem flimsy, so this could be the culprit for poor signals. With our test disc of the Australian Western The Proposition, the DVT407 copes well with images of the Outback, as reds and oranges are delivered with surprising vibrancy. Night scenes have better- than-average black levels, with negligible greying of blacks. Contrast deteriorates slightly when viewed off-centre, but you're likely to be viewing the screen head-on in any case. The speakers are also good, delivering Nick Cave's soundtrack clearly.